Next, simply added raw rice to the cooked mix. Cover and cook till done. Serve hot with fresh homemade garlic chutney!! This recipe above is a delicious variation of the DC recipe, now isn't it? I thought so too. But when I got into the kitchen, I was overtaken by the urge to make something with fenugreek leaves, ground masalas, cashews, and soy chunks. And so by the time I finished, THIS is what I got. 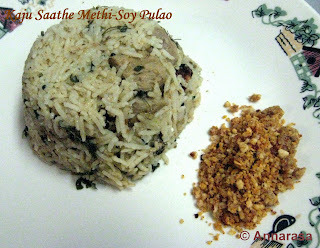 I did serve it with a garlic chutney;) Both recipes - Kaju Sathe Methi-Soy Pulao (Fenugreek-Soy Rice with Cashews) and Dry Garlic Chutney - are my own recipes. Hey DK! I love this recipe too. Just created it in a moment of serendipity!! One of the best Food Blogs, I have ever come across.